AUSTRALIA'S bowlers look alive again and their spark-up has left a provocative question hanging in the air. Does Australian cricket need the Gabba more than it thinks it does? What really matters most … the pitch, the facilities, the crowds, the trimmings? And if it is the pitch, what's the weighting? These are questions that must be answered to truly sort out the pecking order and priorities of Australian cricket grounds. Does a great pitch like the Gabba mean more than a new or remodelled stadium with better crowds and trimmings? Yes, it was only Sri Lanka - and a desperately weak Sri Lanka at that - but Australia play well at the Gabba, not having lost at the venue for 30 years. The sight of keeper Tim Paine taking deliveries with the new ball with fingers pointing to the sky and Nathan Lyon getting balls spitting up towards Paine's rib cage was a rousing endorsement of the Gabba's greatest virtue - its bouncy pitch. Australia's Test team suddenly had a pulse again. Slips fieldsmen were expecting action every ball. Close in men looked like vultures rather than statues. Pat Cummins shone on the Gabba pitch. 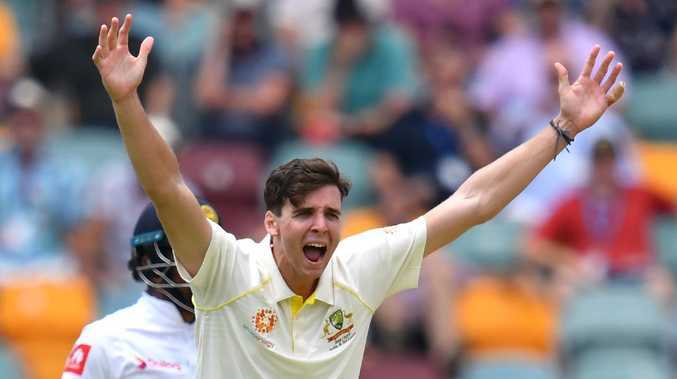 After the prolonged heartache of the Melbourne and Sydney Tests against India, it was a joy to see young Jhye Richardson zooming in as if he had just snapped a leash. Richardson was a nerveless revelation. He bowled full and swung the ball both ways at lively pace. The crowd may have been predictably modest on the opening day, the stands were hot, the parking scarce, the atmosphere mild. But the pitch saves everything at the Gabba - it's the only part of the game on television every ball. Dean Jones, a Gabba watcher or player for the past five decades, said he had never seen a Gabba deck turn more. Lyon's first ball of the Test turned and bounced sharply and, after the misery of less than knee-high bounce of his home ground Sydney, he looked a desert explorer who had just spotted an oasis. The Aussie bowlers had a ball on the opening day. Bounce is a beautiful quality in a cricket pitch. 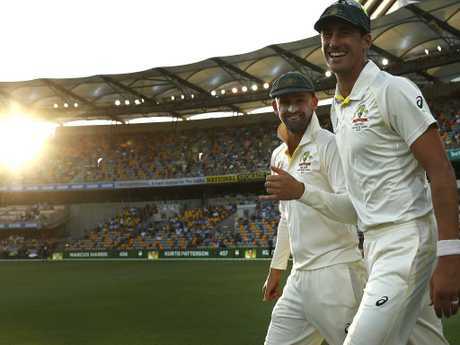 The Gabba is hosting this Test because it has slipped to No.5 in Australia's Test match rankings in the grounds due to ageing facilities and a meeting was held on Thursday among local powerbrokers to address the issue. 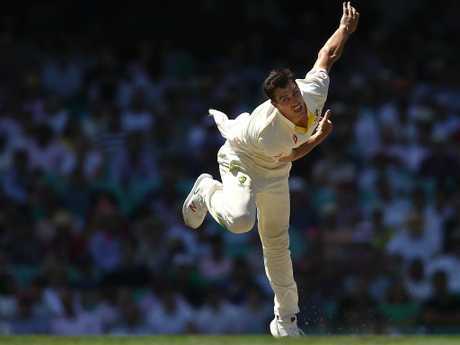 But, for all its shortcomings, the Gabba deck has something for everyone and while it is traditionally seen as a fast bowlers deck, exceptional spinners do well there. Lyon loves the place. Shane Warne has taken more Test wickets here than anyone and would have had itchy fingers watching Lyon.